A young, bearded man with glasses works at his notebook on the terrace and receives a phone call. 4k00:17Attractive african business man using smart phone for taking selfie on the modern office background. 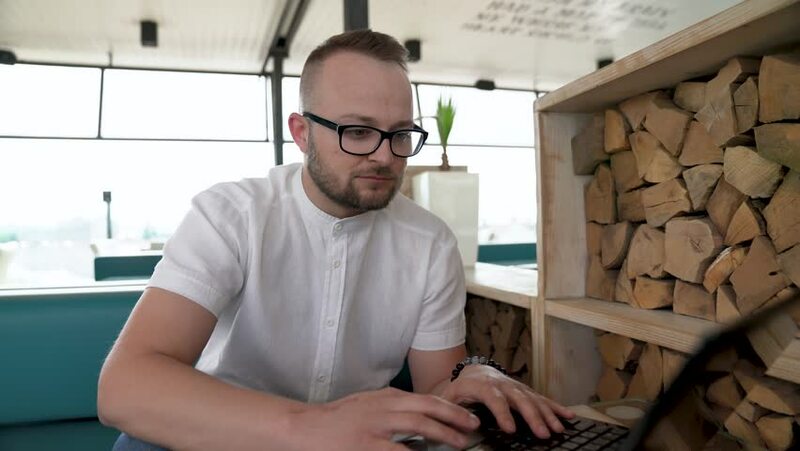 4k00:34A young, bearded man with glasses sits on the terrace and types at the keyboard of his laptop. 4k00:07Handsome Man Uses Laptop Computer while Sitting on Sofa at Home. Man Working, Browsing Through Internet from His Cozy Living Room. hd00:11Senior architect or civil engineer at the construction site. 4k00:24Young man typing on his laptop in office. Beatiful business man writing on notebook. 4k00:10Young african american businesswoman talking on smart phone in the office background while sitting at the table.